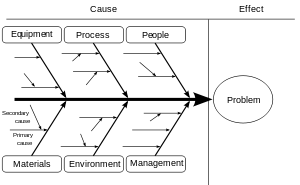 Ishikawa diagram – Lean Learning Revolution! I’m a big fan of Pete Abilla’s shumla blog. Way back in the spring of 2007, the title of Pete’s post was “Ask ‘Why’ Five Times About Every Matter”. This is a quote from the visionary Taiichi Ohno. I’ve re-posted below and I hope you get as much out of this as I have. In a series of events, where people are involved, mistakes happen. Functional areas such software engineering, industrial engineering or more general areas such as medicine, law, or sociology — these areas are composed by a series of events, involving people, process, machines, environment, and other items. Undoubtedly, mistakes will happen. What typically happens in response to mistakes is that blame is thrown around, which builds resistance, then communication fails which could lead to project failure. The better approach is to identify the root causes of mistakes and attacking that, instead of what might be perceived as the cause: Perceived causes are most likely symptoms and not the root cause, in which case the problem was never really solved. This, more rigorous and long-lasting, approach to solving problems is called Root Cause Analysis. The circuit has overloaded, causing a fuse to blow. There was insufficient lubrication on the bearings, so they locked up. The oil pump on the robot is not circulating sufficient oil. The pump intake is clogged with metal shavings. Because there is no filter on the pump. There are several tools that can aid in the process of Root Cause Analysis. Basically, it is a simple approach of asking “why” several times until you arrive at an atomic but actionable item. To visually view the process of the “5-why’s”, a tool called an (Ishikawa Diagram) or a (Cause-and-Effect Diagram) or a (Fishbone Diagram) is often helpful — this tool is referred by either of these. At the head of the Fishbone is the defect or effect, stated in the form of a question. The major bones are the capstones, or main groupings of causes. The minor bones are detailed items under each capstone. this happens because of g; g happens because of f; f happens because of e; e happens because of d; d happens because of c; c happens because of b; b happens because of a. The excercise above is crucially important — you must test your logic so that it makes pragmatic sense and that the atomic root cause is actionable — that is, you can do something to correct it, reduce it, or eliminate the root cause. It is helpful to pull many people into the construction of these diagrams, as this ensures enough diversity of thought to make sure you get the righ potential root causes. Keep asking “why” until you arrive at something atomic and actionable. The purpose of this tool is to answer a question, then brainstorm about how to fix the identified root cause. Getting more people involved will give them a sense of ownership — and that sense of ownership is very important because now that they feel part of the process, resistance to change will likely be less of a problem. I once helped a large healthcare organization save several million dollars. This organization had the largest call center in California, handling over 8 million calls per year. These were mostly inbound calls, resulting from some internal mistake that caused people to call. My job was to identify the largest opportunity (call type), why are people calling, and eliminating or reducing the root causes. We got a cross-functional team together and proceeded with the Ishikawa excercise and identified several root causes. After running the root causes against a prioritization matrix, we went after the low hanging fruit, then the more difficult root causes after that. The result? We demonstrated a quantifiable reduction of inbound calls of this specific type — a reduction of ~8%, which amounted to over $2 Million Dollars in cost savings. I believe what he means is that data, is a degree removed from the actual place where the phenomena is happening. He placed a greater value on being where the work is done and where value is added. Whereas data is often on a computer screen or on paper. He preferred to be at the source of the phenomena. Root Cause Analysis can be used anywhere. In software engineering, it can be used to identify the root causes of bugs in code; in industrial engineering, root cause analysis can be used to identify defects in design; in medicine, root cause analysis can be used to arrive at the reasons for mistakes or lack of patient satisfaction. Root Cause Analysis is a helpful business tool with application to all areas of business and technology. Eliminating or reducing the root cause is much more effective than fixing a symptom. Involving people in the process will ensure buy-in and the elimination of resistance. Ohno believed that by empowering each associate to have ownership and improve their work and the Gemba, that is how innovation is achieved and a culture of improvement is created — it is empowering your people to make the right changes using the tools that work — Root Cause Analysis is one of the tools that can help empower your employees and help to create a culture of improvement throughout your enterprise. One item missed by most people is that Toyota doesn’t just build cars, but it also builds people. Root Cause Analysis is an effective tool that helps associates feel empowered to make their everyday work better. Root cause analysis (RCA) is a class of problem solving methods aimed at identifying the root causes of problems or incidents. The practice of RCA is predicated on the belief that problems are best solved by attempting to correct or eliminate root causes, as opposed to merely addressing the immediately obvious symptoms. By directing corrective measures at root causes, it is hoped that the likelihood of problem recurrence will be minimized. However, it is recognized that complete prevention of recurrence by a single intervention is not always possible. Thus, RCA is often considered to be an iterative process, and is frequently viewed as a tool of continuous improvement. RCA, initially is a reactive method of problem detection and solving. This means that the analysis is done after an incident has occurred. By gaining expertise in RCA it becomes a pro-active method. This means that RCA is able to forecast the possibility of an incident even before it could occur. While one follows the other, RCA is a completely separate process to Incident Management. Root cause analysis is not a single, sharply defined methodology; there are many different tools, processes, and philosophies of RCA in existence. However, most of these can be classed into five, very-broadly defined “schools” that are named here by their basic fields of origin: safety-based, production-based, process-based, failure-based, and systems-based. Safety-based RCA descends from the fields of accident analysis and occupational safety and health. Production-based RCA has its origins in the field of quality control for industrial manufacturing. Process-based RCA is basically a follow-on to production-based RCA, but with a scope that has been expanded to include business processes. Failure-based RCA is rooted in the practice of failure analysis as employed in engineering and maintenance. Systems-based RCA has emerged as an amalgamation of the preceding schools, along with ideas taken from fields such as change management, risk management, and systems analysis. Despite the seeming disparity in purpose and definition among the various schools of root cause analysis, there are some general principles that could be considered as universal. Similarly, it is possible to define a general process for performing RCA. The primary aim of RCA is to identify the root cause of a problem in order to create effective corrective actions that will prevent that problem from ever re-occurring, otherwise known as the ‘100 year fix’. To be effective, RCA must be performed systematically as an investigation, with conclusions and the root cause backed up by documented evidence. There is always one true root cause for any given problem, the difficult part is having the stamina to reach it. To be effective the analysis must establish a sequence of events or timeline to understand the relationships between contributory factors, the root cause and the defined problem. Root cause analysis can help to transform an old culture that reacts to problems into a new culture that solves problems before they escalate but more importantly; reduces the instances of problems occurring over time within the environment where the RCA process is operated. Notice that RCA (in steps 3, 4 and 5) forms the most critical part of successful corrective action, because it directs the corrective action at the true root cause of the problem. The root cause is secondary to the goal of prevention, but without knowing the root cause, we cannot determine what an effective corrective action for the defined problem will be. Ask why and identify the true root cause associated with the defined problem. Identify corrective action(s) that will prevent recurrence of the problem (your 100 year fix). Identify effective solutions that prevent recurrence, are within your control, meet your goals and objectives and do not cause other problems. Observe the recommended solutions to ensure effectiveness. Variability Reduction methodology for problem solving and problem avoidance. Barrier analysis – a technique often used in particularly in process industries. It is based on tracing energy flows, with a focus on barriers to those flows, to identify how and why the barriers did not prevent the energy flows from causing harm. 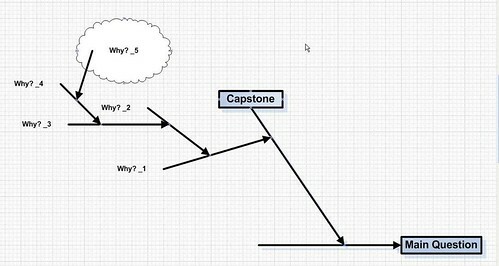 Causal factor tree analysis – a technique based on displaying causal factors in a tree-structure such that cause-effect dependencies are clearly identified. 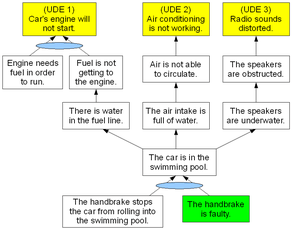 Change analysis – an investigation technique often used for problems or accidents. It is based on comparing a situation that does not exhibit the problem to one that does, in order to identify the changes or differences that might explain why the problem occurred. 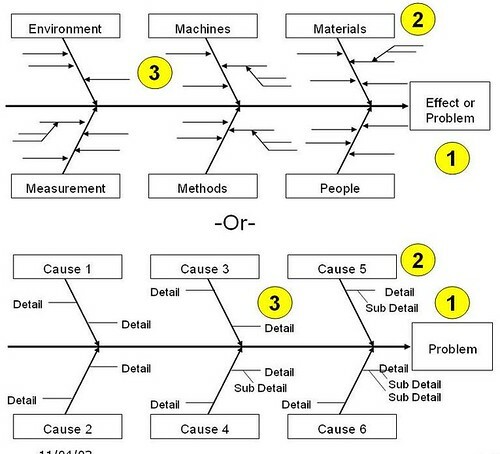 Current Reality Tree – A method developed by Eliahu M. Goldratt in his theory of constraints that guides an investigator to identify and relate all root causes using a cause-effect tree whose elements are bound by rules of logic (Categories of Legitimate Reservation). The CRT begins with a brief list of the undesirables things we see around us, and then guides us towards one or more root causes. This method is particularly powerful when the system is complex, there is no obvious link between the observed undesirable things, and a deep understanding of the root cause(s) is desired. Ishikawa diagram, also known as the fishbone diagram or cause-and-effect diagram. The Ishikawa diagram is the preferred method for project managers for conducting RCA, mainly due to its simplicity, and the complexity of the rest of the methods. RPR Problem Diagnosis – An ITIL-aligned method for diagnosing IT problems. Common cause analysis (CCA) common modes analysis (CMA) are evolving engineering techniques for complex technical systems to determine if common root causes in hardware, software or highly integrated systems interaction may contribute to human error or improper operation of a system. Systems are analyzed for root causes and causal factors to determine probability of failure modes, fault modes, or common mode software faults due to escaped requirements. Also ensuring complete testing and verification are methods used for ensuring complex systems are designed with no common causes that cause severe hazards. Common cause analysis are sometimes required as part of the safety engineering tasks for theme parks, commercial/military aircraft, spacecraft, complex control systems, large electrical utility grids, nuclear power plants, automated industrial controls, medical devices or other safety safety-critical systems with complex functionality.